Show Me The Movies: Review: The Darkest Hour: Oldman's finest hour the highlight of this crowd pleasing historical drama. Review: The Darkest Hour: Oldman's finest hour the highlight of this crowd pleasing historical drama. The role of Winston Churchill is one that has been quite popular among actors down through the years, most recently with John Lithgow in The Crown and Brian Cox in Churchill performing admirably as this famous historical figure but Gary Oldman's performance as the British Prime Minister in Joe Wright WWII drama is one for the ages and one that will surely land this exceptional actor a deserved Academy Award for the role. This thrilling and inspiring true story begins at the brink of World War II as, within days of becoming Prime Minister of Great Britain, Winston Churchill must face one of his most turbulent and era defining trials: exploring a negotiated peace treaty with Nazi Germany, or make a principled stance to fight for the liberty and freedom of a nation under fire. As the unstoppable Nazi forces march across Western Europe and the threat of invasion is inevitable, Churchill must withstand his darkest hour and rally a nation on the road to change the course of world history. Director Joe Wright is no stranger to movies set during the World War with Atonement among his back catalogue, setting the scene for this wartime drama was always going to be in a safe pair of hands and the mood and tone of this troubled time is captured perfectly throughout. What raises this feature to a higher level than it's contemporaries in this area is the remarkable lead performance of the highly talented Gary Oldman. 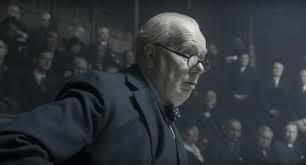 Depicting Churchill's brashness, stubbornness, humanity and devilish sense of humour quite brilliantly Oldman also brings the Prime Minister's now infamous rousing speeches to life with a vigour and energy unparallelled by any previous actors in a performance that must surely land him a maiden Oscar win. He has strong backing also in the form of Ben Mendelsohn, Kristin Scott Thomas and Lily James who add commendable backing in their respective supporting roles but this is undoubtedly the Gary Oldman show.